Mice, spiders, mosquitoes, snakes, aphids, rats, gophers, and many other backyard and garden critters are considered pests, and there are different ways to control or eliminate their presence and populations. Pest control, however, could be damaging to birds, even in otherwise bird-friendly yards. Learning how to safely and effectively control unwanted pests without risking birds is essential for any birder. Not all wildlife is equally welcome in every yard, garden, or landscape, and many so-called pests are the victims of fear and persecution. While some can cause damage to homes or gardens, carry mites or diseases that can be harmful to humans, or may even themselves be aggressive if mistreated, it is important to note that every creature has its own place in the local ecosystem. Many of these critters are also part of birds' food chains, and removing them indiscriminately can upset the natural balance of predators and prey in the area. There are times, however, when less desirable pests can become too numerous for comfort, and it may be necessary to curb their populations. Direct Toxic Contamination: Birds can quickly become contaminated when they come into contact with pesticide gels, sprays, or pellets by roosting or perching in contaminated plants or if the toxins contaminate a nearby bird bath, feeding area, or shelter. Even if these poisons are not immediately fatal, the birds may suffer from neurological damage that can lead to debilitation or a painful, lingering death. Biomagnification: Birds do not have to be directly contaminated to be poisoned by pesticides. If their prey is contaminated, such as a caterpillar, spider, fly, mouse or other prey, the bird will ingest that toxin when they feed. The levels of contamination will gradually build up to cause the bird's death after a lengthy period of lingering toxicity and decaying health. 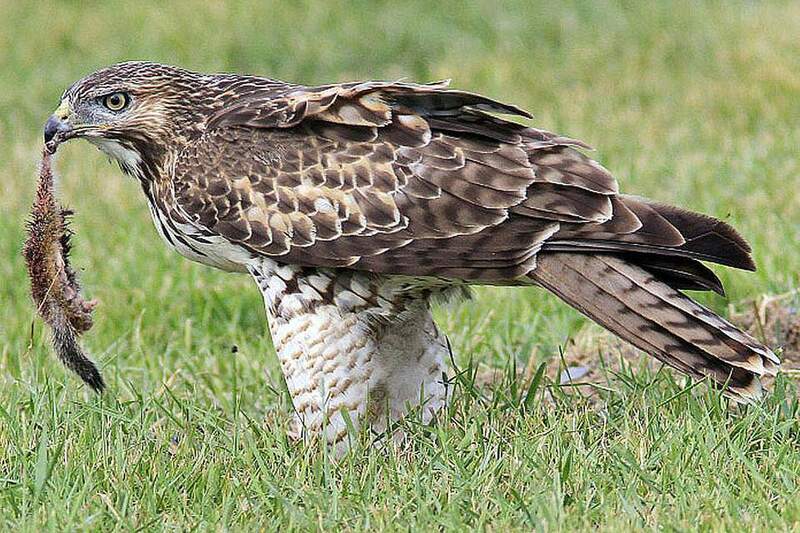 This process, called biomagnification, is particularly harmful to raptors and other apex predators that may feed primarily on one type of prey. Trapping: When traps are used to cull rodent populations, birds can be inadvertent victims. A snap trap will instantly crush a bird's brittle bones, and a glue trap will snare plumage just as easily as it does fur. Even more humane traps are indiscriminate and may capture birds, and the stress of confinement can be fatal to a bird. Food Loss: Many critters that are considered pests are actually valuable food for backyard birds, and if chemicals, traps, and other means are used to remove those food supplies, the region may not support as many healthy birds. When insecticides are used, young birds especially will suffer from malnutrition as they cannot get the proper amount of protein they need for healthy growth. Predation: When homeowners allow dogs and cats to roam to keep down rodent or reptile populations, they are unable to account for other animals, including birds, that their pets will prey upon. Dogs and cats will eagerly prey upon whatever animals they may be able to catch, including vulnerable hatchlings and other backyard birds. Cascade Disruptions: When homeowners eliminate so-called pests from their yard, they may also be eliminating other critical resources wild birds rely on. Many birds, for example, use spider webs to build their nests, and bugs that help pollinate flowers and berry bushes are essential for keeping those natural bird foods healthy and abundant. Feathered Pests: While certain birds can be considered pests and products are advertised to remove those pests, the products, including traps, glues, and sprays, cannot differentiate between bird species. Products designed to be harmful to one bird, such as pigeons, can be harmful to many birds. It is better to use selective techniques to discourage bully birds or otherwise keep invasive species or other unwanted backyard birds away rather than resorting to more harmful controls. Fortunately, there are many ways to avoid harming wild birds while still discouraging unwanted pests. Avoid using any toxins, poisons, or other chemicals for pest control, and instead opt for exclusion methods such as blocking access or removing pests' food sources to discourage their presence. If poisons or chemicals are absolutely necessary, they should be used completely out of reach of birds, such as used indoors or in blocked areas where wild birds cannot access. Remove standing water from the yard to minimize breeding grounds for insects, and use drippers or wigglers in bird baths to keep insect populations under control. Do not allow pets to roam freely to discourage pests, though they can be permitted in the yard regularly under supervision to mark their territory and alert pests about nearby predators. Take steps to keep mice away from bird feeders and discourage pests from inside a house or buildings, but permit them to fulfill their role in the outdoor ecosystem. Prune shrubs to keep them above the ground so they provide less shelter for unwanted pests but still serve as shelter for local birds. Work to attract backyard hawks or backyard owls to allow the raptors to serve as natural pest control for rodents, snakes, and large insects. Encourage bird diversity in the yard through providing water, nesting sites, and suitable shelter so more birds will be feasting on insects, caterpillars, spiders, and other prey. While different pest control products claim to be safe and easy to use, they're often unsafe for wild birds. By understanding how these products and techniques can be harmful to birds, birders can take simple steps to keep birds safe and live in relative peace with other wildlife. Woodpeckers Driving You Crazy? Here's What to Do!